Most things that have a start also have an end, don’t they? A nice holiday in Southeast Asia. We started saying goodbye on 17 January 2008 at the party marking the end of my time at the EPO. While gradually fading from your memories we brought you some unsolicited news now and then about how we fared in Ethiopia. But farewells too end eventually - this English language website post to you will be our last. What better moment for that than exactly one year after the day we set foot on Ethiopian soil the first time: 30 January 2008! Below are just a few final thoughts to share. 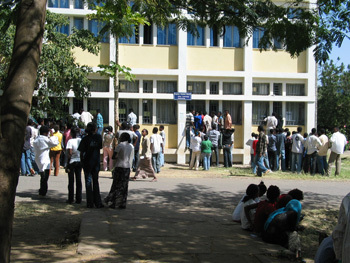 Did Arba Minch University change much as a consequence of this Dutch VSO placement? No. AMU is busy changing much, but that is because of its University Transformation process, prescribed by the Ethiopian Ministry of Education: how to cope with a 4-fold growth in student population in 4 years, and meanwhile shift education emphasis to science and engineering. Did I achieve anything at all? Surely. Sustainable results? Some, not all; mainly because staff turnover in the AMU ICT team is fast and absolute, and transferred skills and improved ways of working can disappear with each staff leaving. My previous ICT coordinator has gone to do his PhD in Italy; the current one is preparing to do his in Malaysia soon. Two newly recruited key ICT staff are plotting to do their MSc overseas at the first possible opportunity: perhaps this year, latest next. No one seems to stay longer than two years in post. Things I tried to instill (procedures, documentation, implementation and operating principles) may evaporate anytime. Has it then been worthwhile? Yes. There were many good times with interesting and pleasant people. Some joint successes. A thorough taste and appreciation of a different world, culture, and values. It has in fact been sufficiently worth our while for me to sign up for another year. AMU offered me a paid position similar to the Indian expat lecturing staff, but I preferred to stay with VSO – not in the least because in that way I could more easily negotiate an extra 3-week break in-between service years. That is the reason why this post comes to you from the wonderful island of Langkawi, where we conclude a Southeast Asia trip. What will work be like in the second year? For one thing, it is like starting over. The University Transformation studies conducted at AMU in 2008 have shown a huge need for more ICT facilities (in fact plans are quite overambitious when looking at ICT staff skills, present and recruitable). Therefore the ICT policy and implementation planning will need to be adapted, and much further ICT staff recruitment and training are to be arranged. Those were my starting activities last year too. Biggest challenge will be again to find ways to consolidate knowledge, procedures, and processes at the University while coping with the strong turnover of existing staff – or somehow preventing that turnover. “Being there” seems in itself enough to attract ever more work. Hanny originally started with liaison work for a Dutch foundation supporting an Arba Minch orphanage, and similar assistance to a second Dutch foundation that runs other education support projects. Then came the work associated with the Zigit Bakole school project that we started ourselves and to which various people donated. There are new phases in that project: building classrooms, having more desks made. 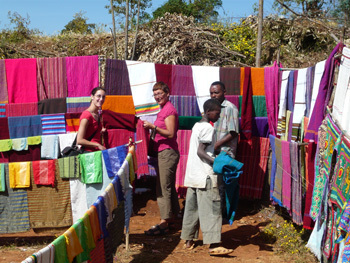 And in the end of 2008, a young Spanish couple that visited Arba Minch a few weeks started activities and Spanish funding for another group of extremely poor people in another mountainous area near Arba Minch, for which Hanny liaises with the local coordinator. The project aims at helping what is generically called “the marginalized”, those that are on the lowest levels of society here. Marginalized people are strangely enough those groups that have professions that are very dearly needed in traditional society: blacksmiths, potters, skinners/tanners. They are all lower ranking than the regular farmers, however much the latter are still solely dependent on rain, and actually on the tools that the marginalized create. Rain? Has there been rain then? Yes! The most recent rainy season was abundant. In a few areas even far too abundant, and that too has destroyed harvests here and there again. But although much international food aid is still being provided nationwide to overcome the shortages due to the former two rainy seasons failing, the food security situation seems to revert to normal. 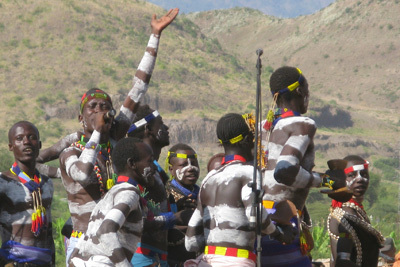 Although Arba Minch is usually a rather sleepy town with little to do in terms of mass entertainment, there is one exceptional weekend in the year that the town hosts a most exciting event: the Arba Minch Festival of Music and Dance, aka the 1000 Stars Festival. Facilitated by a grant of 200,000 USD of the Christensen Fund, an NGO stimulating and preserving cultural identities worldwide, this festival lasts three days, in which over a thousand participating performers from many ethnic groups from Ethiopia’s Southern Nations, Nationalities and Peoples’ Region (SNNPR) show off their traditional dances and music. It is a small wonder that this mid December festival, now in its 6th year, is not discovered by a big international audience yet. Only a few dozen foreigners were around. Here is a compilation (.wmv, 8 minutes) of short clips showing some of the dancing events. Enjoy! And remember – even though our incidental English-language blogging stops here, you will continue to find impressions of our Ethiopian activities on our Dutch weblog .